Indian rupee edge lower against the dollar after the country’s trade deficit widened to its highest in more than five years. Pair USDINR now at 68.56 against 68.52 previous close. 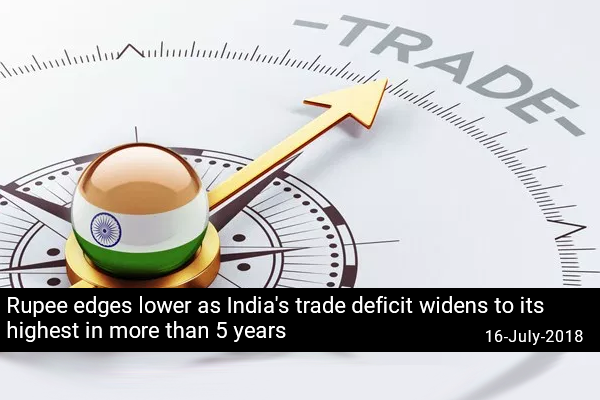 Data released late Friday showed that India’s trade deficit widened last month to $16.6 billion, the highest since May 2013, prompted by a near 57% jump in the oil import bill. Crude oil import jumped by 56.6% in June to $12.7 billion as global Brent prices increased by 60.47% in the month from a year-earlier, the data showed. We expect the pair to tip in range between 68.40-68.66 today. Equity benchmarks has started the week on a flat note, with the Nifty maintaing 11,000 in the opening quotes. The Sensex fell 27.62 points or 0.08% at 36514.01, while the Nifty is down 17.20 points or 0.16% at 11001.70. The market breadth is narrow as 268 shares advanced, against a decline of 170 shares, while 62 shares were unchanged. Asian markets are lower today. The Shanghai Composite is off 0.46%, the Australian' ASX200 is down 0.32% and the Hong Kong's Hang Seng is trading lower by 0.15%. European markets finished higher on Friday with shares in France leading the region. The CAC 40 closed up 0.43% while Germany's DAX gained 0.38% and London's FTSE 100 ended up by 0.14%. US. stocks edged higher on Friday, with the S&P 500 hitting a more than five-month high, as gains in industrials and other areas offset a drop in financials after results from three big Wall Street banks mostly disappointed investors. The Dow Jones Industrial Average rose 94.52 points, or 0.38 percent, to 25,019.41, the S&P 500 gained 3.02 points, or 0.11 percent, to 2,801.31 and the Nasdaq Composite added 2.06 points, or 0.03 percent, to 7,825.98. The yuan had a choppy beginning to the week amid a slew of economic data, released earlier today. China’s economy expanded 6.7% in the June quarter, slowing from 6.8% in the previous quarter and in-line with forecasts of economists poll. Industrial output increased by 6% last month, slower than the 6.5% pace expected by economists, while retail sales and fixed-asset investments grew by 9% and 6%, respectively, in-line with expectations.